Today I have a fun tutorial for cute gift box..and its GREEN project, we will recycle or I should say Upcycle some craft supplies. 1 sheet of 2" x 2" cardstock, double sided DP, riddon,Scor-tape, nestabilities -Large scallop circle and circle dies, a Sassy image (colored) and the thin chipboard from the back of the paper pads we use for crafting...Yeah will recycle it now. Cut 2 scalloped circles out of thin chipboard( Back of the paper pad) and 4 scalloped circles out of the cardstock..using the Spellbinders large scalloped circle die...if don't have that die you can use any other thing to cut out above all into 5" circle( can use a small dish too). Make a sandwich of two cardstock circle with the chipboard circle in the middle..just to cover the chipboard...adhere firmly...Repeat again to make two of it. This will the base and the top of the box. Cut 1 strip of 2" X 11" piece of cardstock and another 1"x 11" piece. 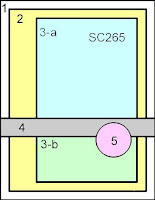 Cut 7-8 pieces of 1/2" x 2" cardstock. Apply scor-tape to short end of the 2" x11" cardstock strip and adhere the ends to form a pipe like circle. Fold the 3 -1/2" x 2" strips into half...apply scor-tape and adhere to the circle in a L-pattern ..as shown in the picture above. This makes the base of the box..
Repeat steps 4-6 with the 1" x11" strip of the cardstock to form the lid..check to make sure the the lid fits perfectly inside the base. Now the pretty part...adhere another die cut circle on the top of the box...added the Sassy image ..I used the TEDDY BEAR..I love it . 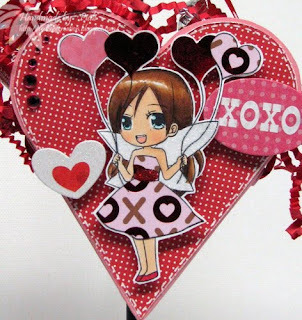 I also added a die cut heart which can be used as a tag to write a message or name. I just added a strip of 1 1/2" x 11" strip of DP on the outside of the box to make it prettier..but its optional. Embellish it anyway you like..I added a lovely bow and Faux stitching with a white gel pen.. It will a perfect for candies, jewelry, small craft supplies...etc..a fancy gift box for someone special. Hope you all like this tutorial . If you try out my tutorial this week and link your project up HERE , you will receive a FREE dollar deal image. Please have your project linked up by Saturday, Feb 6th. 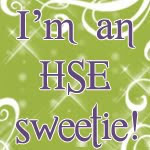 My journey with the yummy cupcakes starts today...and here is my 1st card as HSE Sweetie.. I used the lovely colors of icing and pink candy corns as my inspiration today... and a sweet Greeting Farm stamp from Hope Eternal Stamps. I found a button just like those Sweetheart candies on the cupcake.. perfect!!! I also sprinkled few tiny punched hearts and added some yellow Crystals by ZVA Creative.. So play along with me ..post a direct link to your project HERE and to upload to a public gallery like SCS or PCP make sure to use keyword CIC44. This is also my Pile It On DT card for the week...so I piled on few more challenges with the cupcake. 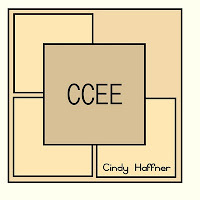 Saturday Spotlight: Bigger is Better...the image is big one. Copics, ZVA Creative crystals, Spellbinders Label 8 die, ribbon,MS border punch,button. This is my very first Mognolia creation...for this week's Stamptacular Sunday challange. There is sweet story behind this image...before christmas I came across a lovely blogcandy. In order to win the candy, bloggers were asked to leave a comment with their Christmas wishlist. So I followed it and wrote about my wish of getting few Magnolia stamps..soon I received an email from a very Sweet crafter... she asked me for my snail mail and few weeks later I received a package full of stamped Magnolia images....it was from U.K. ...the generous lady who sent me the package is Mina of Pinkpuds ...she is such a sweetheart!! I still don't have any stamps yet..but I have a whole bunch of images to play with now. 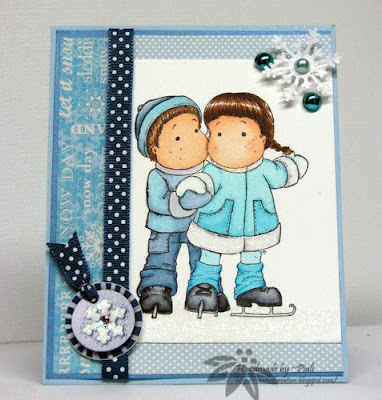 Create a winter themed card or project using only shades of blue and white. This week our sponsor is Instyle Stamps..and one lucky winner will get 4 free ISS images of their choice. 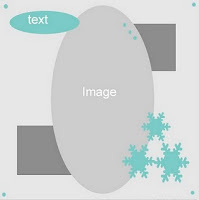 So join in for the wintery fun ..make sure to post a direct link to your project HERE. Today I have CAS card to share with you all. I usually make A2 cards ...but this is a circular card. 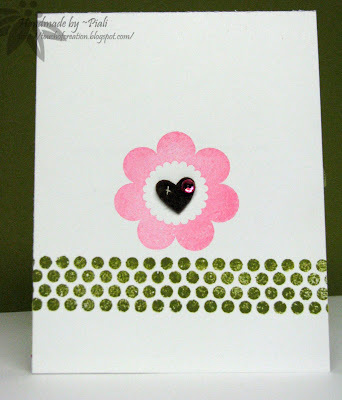 Its super easy to make ..I used Spellbinders for the card base..sketch is from this week's Mojo Monday challenge. The beautiful stamp is ROSE BUD from Inkadinkado...love it. Simply embossed the image using versamark & black embossing powder. Mojo Monday: Sketch...I used the round one. I hope you enjoyed my card today. Be sure to check out the great new items at ABC Toys and Crafts store. Sentiment: Basic Grey Mini stamps. Sakura glitter pen, Spelbinders, Versamark ink,Black embossing powder, Making Memories ribbon, Dew drops,chipboard heart. 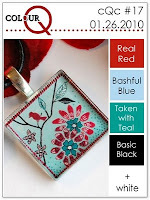 Welcome to InStyle Stamps Valentine Hearts Blog hop! If you are here from Lysa's blog..you're right on track ...if you are just joining me now ,please go back HERE to start so that you don't miss any of these fab creations..
Today I have made a Heart shaped Valentine treat bag using the super cute image..."Balloon Holding AVA" ....she is so sweet..
Visit all our Fabulous DT members and enjoy thier creations..leave a comment ..and be sure to head over to ISS Blog to vote for your favorite DT project ...Then, in order to be entered into the drawing to win the prize of 5 yards of new ribbon from May Arts, leave your name with Mister Linky. You have until 11:59pm EST on Sunday, Jan 31st to enter, and the winners will be announced on the InStyle Stamps blog on Monday. 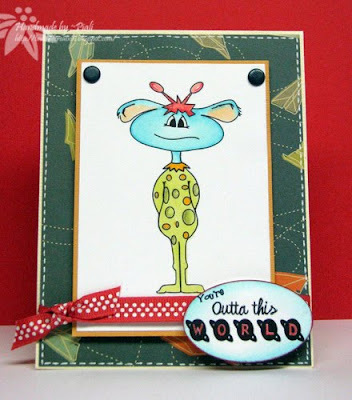 This is the last DT stop..now hop over to InStyle Stamps Blog to vote.. don't forget to leave your name with Mr. Linky. 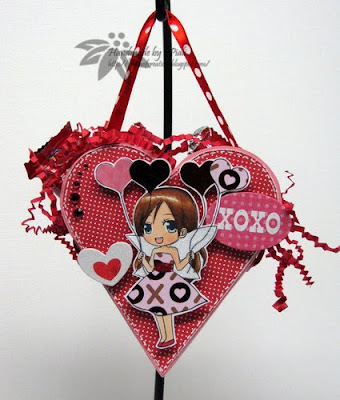 This treat bag is also for few challenges..
Hand full of stamps:" I give you my Heart"
DareU2 Digi stamps: Valentine /Hearts. Stampavie and more: love/ Valentine. Pixie Cottage: Pink & Red. Yay!! Its Friday !!!! 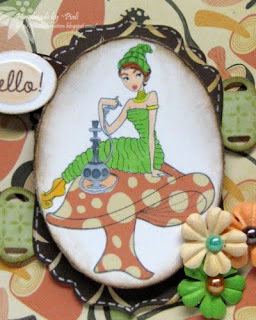 This weekend will be a busy one..I will have lots of post this Sunday ..
Today I have a very fun card to share.. This card is for few challenges....some new challenge site I have come across lately. SC Sketch challenge: Sketch ..First time joining this challenge, I get lost when it comes to SCS...really can't follow this forum well..
Digital-Ink Co: A pet or baby birthday theme containing the 4 primary colors, red, blue, yellow, green and one neutral color...my 1st time here too.. I have made a boy card with all primary colors and white. Image--- definitely non-Human..lol, Ribbon for texture, new image..I'm using it for the 1st time. Image & Sentiment: Wiggies~ The Character Cafe. Copics, EK Success Oval punch, distress ink,brads, white gel pen. Labels: cooking with Katie, cosmo cricket, digital-ink co., scsketches, thecharactercafe. New Fairy in the Patch.. There is a someone new at the Patch!!!!.... HEART FAIRY. Absolutely adorable!!! She will be available in WFK store on Feb 3rd.. Play Date Cafe: Color combo. Dutch Dare : Summer in winter... The bright colors,butterflies, flowers , happy kid reminds me of Summertime. Flutterby Wednesday: open challenge with fairy/butterfly. 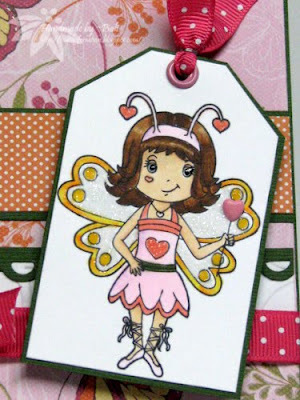 Your Next Stamp challenge: Anything that sparkles...I used glitter on the wings. Happy Thursday!! I have a sweet gift for my daughter..Anushka loves to read and in her class they maintain a reading log...so here is one from me.. This week's SASSY STUDIO challenge is POLKA DOTS!! !....I looooove polka dots. One lucky winner will get 2 SSD image of their choice ...so play along, make sure to post a direct link to your project HERE by Wed~ Feb 3rd. 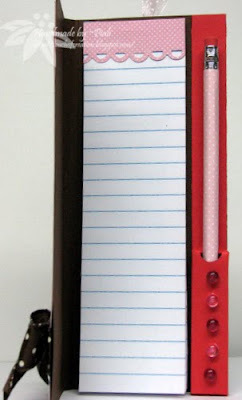 So here is the note pad for her to write....there is a pencil holder too..total package. Whats That?????? This template is from Nichole Heady..check it HERE ...I just added a little thing to it.. The Pink Elephant: Polka Dots, a Bow and Pink...this week Sassy Studio Designs is sponsoring TPE challenge so you have another chance to win 4 SSD images of winner's choice. Cupcake Craft Challenge: ***A MATCHING SET***...again you have a chance to win 4 free images from Instyle Stamps...because ISS is sponsoring the challenge. 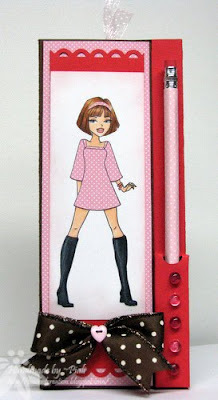 Flourishes Timeless Tuesday challenge: Be inspired by the letter P...so I have Polka dots, Pink,Pencil holder, Paper Piecing, Punched border, Pull-out(bookmark) and a Pretty image..lol. Pixie cottage: Red and Pink. Crazy 4 Challenges: Pretty in Pink. 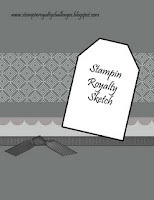 KL Stampin n Scrappin: Punches, dies and Nesties..
Dare U 2 digi stamp: buttons. Pixie Dust Studios: 3D project. Copics, Fiskar's Border Punch, EK Success Circle Punch, Dew Drops,Ribbons,Button,Note pad, scor-tape, pencil. There will be not just one but THREE winners for the game...lots fun ,chit chat and surprises. All you have to do is SIGN-UP.... HERE, with your EMAIL addy and your NAME! YOU WILL HAVE UNTIL SATURDAY AT NOON cst, TO SIGN UP!! 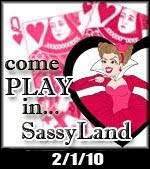 Susan~ our lovely DT sistah will email you the Bingo cards. Now its time for another Sassy Sneak Peek.. I have used Cosmo Cricket~Earth love ...its just perfect for the image. I'm so honored to be a part of the extremely talented Hope Eternal Stamp Design Team. Lucky me!! I get to create with those super YUMMY cupcake ..how SWEET is that!! Really I love Cupcake Inspiration Challenge...please join me next week for my new sweet adventure.. So here is my new MME creation... 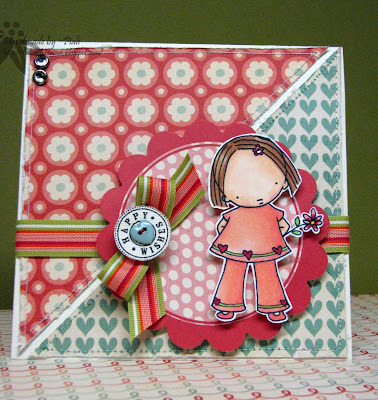 I used my new MFT Pure Innocence stamp and Get sketchy challenge sketch #22 for this card. I'm working on my stitching skills ...trying to get it straight..lol. Allsorts challenge: Hearts and flowers. 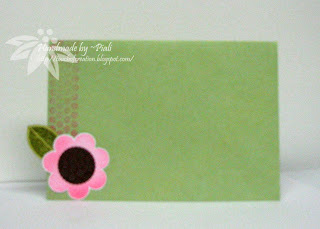 Stampin Sisters in Christ: Something green..
Paper: My Mind's Eye~ Be Loved kit, Bazzill. Copics,Ribbon( from Michaels), jeweled brads, button. 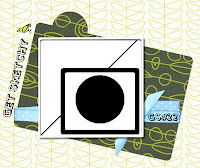 Its my first time for Papertrey Ink Blog Hop...7months ago when I started blogging,I used to admire at pretty polka dot stamps lots of crafters used for their projects..I'm huge fan of polka dots. Gradually I learned about Papertrey Ink...since then they were on my wishlist . At last ...DH got me two PTI stamp sets and some PTI cardstock for Christmas..
Its a great theme for the hop~ TOTAL PACKAGE...to complete a card all thru..like inside,back and envy. I stamped the leaves from Blooming Button Bits set and stamped it randomly inside and added few blings, sentiment is also from the same set.. The back --- I used the Polka Dot Basics II set and the flower from Blooming Button Bits. Sorry the photo is little blurry...but have to run now..my daughter is getting late for her Ballet class. Versamark ink, Clear embossing powder,buttons, pearls,bling chalk ink, Fiskar Border punch, EK Success Border punch. Yeah!! its time pick winner of my little thank you candy.. I used random .org.....Min: 1 Max:73 Result: 17. Thank you for the chance to win your candy. What a lovely bunch of Valentine's stuff. And your creations are just adorable. Thanks for the great inspiration. Michelle..please email me at piali(dot)biswas(at)yahoo(dot)com so that I can mail your goodies to you. Happy Sunday!! Blogland is lot quite this weekend..seems like everybody is at CHA. I'm waiting for the new products...have to grab some as they come to store. 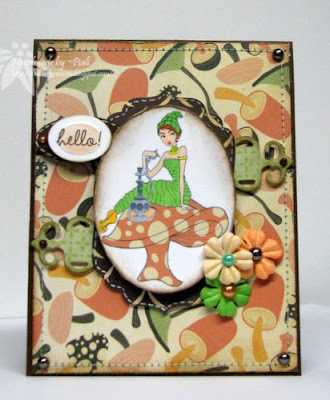 While I wait..you all play along with this week's Stamptacular Sunday challenge.. Create a card that pops up when you open it. 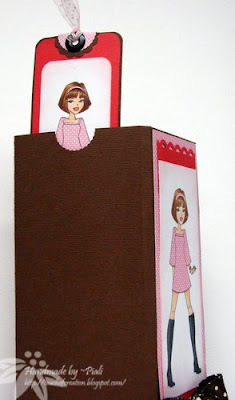 Here is my Pop UP card. I used this CCEE stamper's sketch for this card..
Last Christmas I received a store bought pop up card ..I really liked the inside. Today I tried to make the inside like that card..it came out pretty good. I love Penny Black Critters...absolutely adorable.. The flowers make me think spring...also the floral Amy Butler designer paper, so this card is also for Sophisticat challenges~"SPRING". This week our very own DT Sister SARAH sponsored a fabulous prize....Yeah!! Verve Stamp Set, "Swan Song"
So play along with me...post a direct link to project HERE..
Papers: K & co. Amy Butler collection, Bazzill. Copics, Spellbinders scalloped circle die. 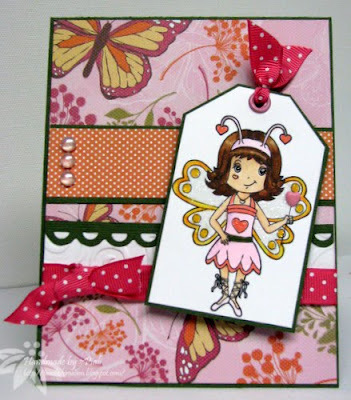 Stamptacular Sunday Challenge~ Party time..